If you need a last minute idea for Valentine’s Day this dessert definitely says LOVE. 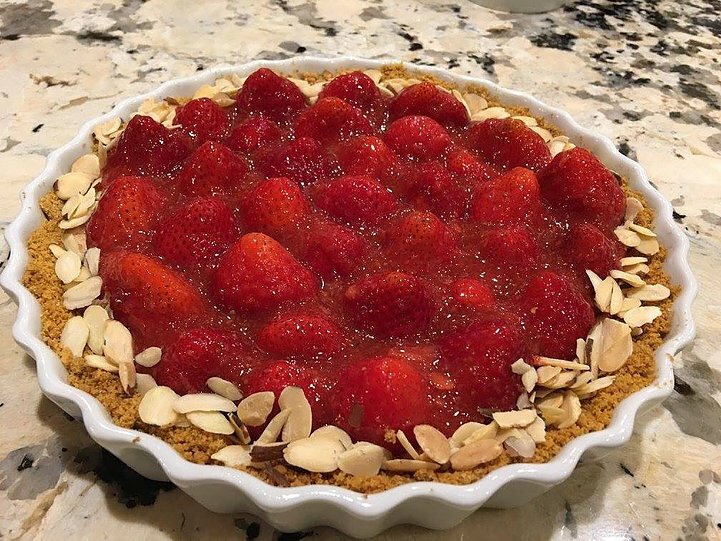 This Strawberry Almond Cream Tart is a beauty and was ready in no time! We are saving it for Valentine’s Day, but we tasted everything as we made it and it was all delicious! The almond cream cheese filling — ooh! We ate spoonfuls of the warm strawberry glaze–aah! The warm graham cracker crumb crust smelled so good coming out of the oven–mmm! The fresh strawberries were super sweet! The best part though, was that I got to spend this time with Ari. It’s special to share this time together! Place graham cracker crumbs in a bowl with sugar, butter, and water and stir to combine. Place mixture in a 9-inch round tart pan coated with cooking spray, pressing into bottom and up sides of pan to 3/4 inch. Bake at 350° for 10 min or until lightly browned. Cool completely. To prepare filling, with an electric mixer whip cream cheese, 1/4 cup sugar, and extracts in a medium bowl until smooth. To prepare topping, place 1 cup of strawberries in food processor and process until pureed. Put strawberry puree, 1/3 cup sugar, and cornstarch in a small saucepan over medium heat, stirring with a whisk. Bring to a boil, stirring constantly. Reduce heat to low and cook 1 minute. Combine 4 cups strawberries and lemon juice. Toss to coat. Spoon glaze evenly over berries. Cover and chill 3 hours. Enjoy!